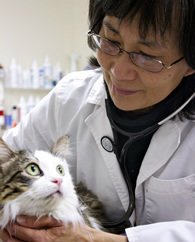 My house call practice is dedicated to supporting you and your cat during home hospice care or euthanasia. The goal of hospice is comfort (palliative) care rather than cure or aggressive treatment. In my practice, I care for cats with terminal illness, as well as cats experiencing discomfort while passing through the natural aging and dying process. feel comfortable voicing concerns about your cat's well-being and also your own process and feelings. "Through the whole process, Dr Chew was kind, compassionate and respectful, in equal measure to her excellent medical care and advice. Her calm, focused presence helped hold Catalina's transition as a sacred time. "